Another mani supporting Breast Cancer Awareness and having some halloween fun. 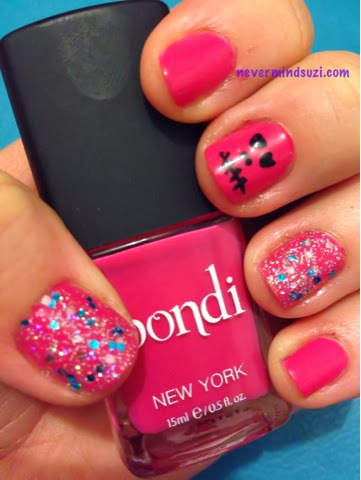 The pink base is a fabulous polish from Bondi - Fuschia-istic. I love the formula on Bondi polishes, they just go on so smooth, some are perfect in one coat, others in two. I added an accent of H&M - Silver, I don't quite understand the name seeing as it's full of blues and pinks. I drew a little skull face on my middle finger adding little hearts for eyes. I think he's rather cute!